The Lateran Treaty - Is it Part of Bible Prophecy? - The Healing of the Deadly Wound? The Lateran Treaty was signed on February 11, 1929 by Cardinal Gasparri (representing Pope Pius XI) and Benito Mussolini (representing King Victor Emmanuel III of Italy). 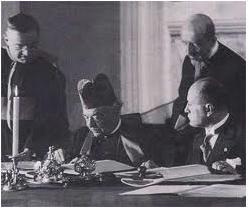 The treaty was then ratified by the Italian parliament on June 7, 1929. Succeeding governments of Italy have all honored the treaty. The document was signed in the Lateran Palace, within what is known as the Vatican City, giving the treaty its name. Its purpose was to restore lands and privileges to the papacy that had been removed at the time of the French Revolution of the late 18th century. It resulted in the creation of the independent state of the Vatican City and granted the Holy See full independence from the Italian government. This is of interest to Bible students because the Lateran Treaty has been proposed as the healing of the deadly wound referred to in Revelation chapter 13. This was even (quite possibly inadvertently) referred to in a news article the next day in the San Francisco Chronicle for Tuesday, February 12, 1929 with the words "Healed wound of many years." Pact ... Healed Wound of Many Years." The capture of Pope Pius VI by Napoleon's general Berthier in 1798 which ended a long period of papal supremacy in Europe. The Protestant Reformation which also greatly lessened the influence of the papacy as people began to read and understand the scriptures for themselves. The wound inflicted upon Pope John Paul II in 1981 from which he recovered. According to theory 1, the deadly wound was healed in 1929, by the Lateran Treaty, when Mussolini gave the area of the papal states (now Vatican City in Rome) back to the Catholic Church reversing the capture of the pope in 1798. According to theory 2, the deadly wound is yet in process of being healed as the Vatican gains more influence and control over worldly affairs. It will be completely healed when it has regained the power it had at its height. We could ask: has all the world wondered after the beast since 1929 or is that yet to come? While Pope John Paul II (theory 3) was very popular, he did not completely fulfill the specifications and his papacy did not see the fulfillment of other particulars of the prophecy. So the Lateran Treaty remains as the basis for one theory on the nature of the healing of the deadly wound of Revelation Chapter 13.